Learn everything from covering a cake to piping, modelling and making sugar flowers. 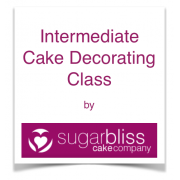 If you’ve always wondered how to achieve super-smooth icing or how to make pretty sugar flowers for your cakes, then a Sugarbliss Cake Decorating Course is for you. Loving Everything To Do With Wedding Cake Decorating! Our intermediate cake course teachers you all the skills from crumb coating, icing to modelling and ..